Greek food is not so popular around the world, for no good reason. Cretan restaurants serve good, tasty meals at relatively low prices. 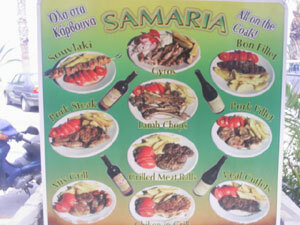 For example: in most tavernas, €10 will get you a starter, a main course and a drink (half a litre of wine or a beer). Since it’s so inexpensive to eat out, Greeks go out regularly to eat. Usually one person will pay for the whole table. Tourists tend to pay separately – waiters have got used to this curious habit, though it’s still better to tell the waiter at the beginning when you order. Cretan tavernas are generally a family affair, with the wife in the kitchen and the husband waitering. Tap water is free in almost all tavernas. Starters are a popular was to begin a meal, and often you get a free gift at the end of the meal, mostly a raki, though some establishments may give small cakes or some fruit. 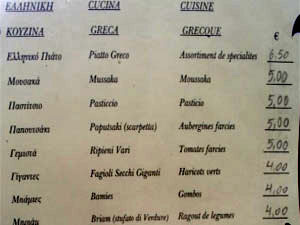 Menus on Crete are generally multilingual, coming in Greek, German and English; some establishments even have menus in French, Czech and Russian. The translations are often quite bad, but rarely incomprehensible, and always amusing, such as ‘Mellon’s Ham’ (Melons with ham), Crap Saganaki and Fried Shrip being this author’s favourite to date. With some exceptions in rural areas, the waiter always speaks English. If there is no menu, it’s quite normal to go into the kitchen to see what fare is on offer. Greeks enjoy their main meal in the night, eating very late and for a long time. They rarely start before 9pm. Breakfast is unheard of, usually consisting of a Greek coffee and plenty of cigarettes. Lunch is rarely more than a gyros pita or sandwich. Small tavernas are cheaper than restaurants, and the food is often served lukewarm rather than hot, as is the standard in the western world. Drinks are served cold. Side dishes usually feature chips or sautéed potatoes, though occasionally a boiled potato or rice may appear. The super-healthy olive oil is used for all cooking. You’ll pay a small cover charge, usually 50-80 cents, which will include some free bread. McDonald’s has ‘discovered’ Crete. Tourists like McDonalds since it has air-conditioning and clean toilets. A good Greek fast food chain is Everest for sandwiches, pizzas and so on. The main Greek fast food, though, is the thousands of small gyros pitta selling stalls, selling pitas (the Greek version of the kebab) for as little as €2.20-2.80 (pricea in 2018 / 2019). The meat is usually pork, though sometimes you can get chicken too. Vegetarians can order a vegetarian pita, in which feta is substituted for meat. Western food is expensive and hard to find; your best bet is a supermarket, particularly Lidl; this German supermarket chain now has eleven shops across Crete.